About a year and a half ago, I spent some time with Muammar Gaddafi. He was in New York City to address the U.N. General Assembly and was staying in a nondescript concrete building on Manhattan's East Side. Through the American p.r. firm that managed his Western press coverage, Gaddafi had agreed to be interviewed by Michael Elliott, the editor of TIME International, and me. Michael and I made our way through a gauntlet of machine-gun-toting cops, secret-service agents and assorted swarthy tough guys. 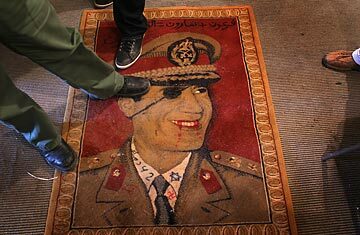 While we waited for Gaddafi, members of his all-female praetorian guards paced the room, dressed in desert khakis, black berets and leopard-skin stiletto heels. We were given only one ground rule for the interview: when directing questions to Gaddafi, we were to refer to him as "Brother Leader." At last Gaddafi emerged. He had a waxy complexion and a thin goatee, and wore something resembling a cape. He greeted us indifferently, sat down and started speaking. At least, I think he did. According to the translation, Gaddafi discussed Iran's nuclear program, the Arab-Israeli conflict and the Lockerbie bombing. But it mostly sounded like a series of grunts and mumbles. Gaddafi looked wan and distracted. Fearing for the colonel's safety, his American handlers had refused to allow him outside the grounds of the Libyan consulate. When we asked about his impressions of America, he said, "We didn't see anything." He hardly came off as an international menace; if anything, this was a tired old man struggling to outrun his past. As we shook hands and left, I actually felt sorry for him. It may seem unfathomable now, but the Gaddafi who came to New York City that fall had worked hard to convince the world he was a changed man. He gave up his nuclear-weapons program and renounced terrorism. He cooperated with the U.S. in the war against al-Qaeda. In return, Washington lifted sanctions. Western money poured into Libya. Condoleezza Rice visited Tripoli. But to his own people, Gaddafi never changed. He was still a murderous megalomaniac, a leader who claimed to be egalitarian even as he allowed his sons and cronies to pocket billions from the country's oil industry. The only mercy in Libya's current unraveling is that the Brother Leader has once again consigned himself to the global-pariah club. The Gaddafi example thus highlights a persistent dilemma for U.S. policymakers: Should we negotiate with dictators? In most respects, the West's decision to engage Gaddafi has turned out to be a disastrous bargain. Far from initiating domestic reforms or improving human rights, the Libyan leader used the legitimacy conferred on him by the West as cover to crush dissent and steal more of his country's wealth. Whatever cooperation the U.S. established with Tripoli has now been severed irreparably. It's inconceivable that any Western government will have anything to do with Libya so long as Gaddafi is in power. And yet the world may still inherit a failed state when he goes. This isn't the first time we've been taken in by a tyrant. Franklin D. Roosevelt and Harry S. Truman believed they could persuade Stalin to work constructively with the U.S. after World War II; Stalin annexed Eastern Europe instead. Bill Clinton cut a deal in Dayton with Slobodan Milosevic to end the fighting in Bosnia in 1995, then three years later, he had to go to war against Milosevic in Kosovo. A succession of U.S. Presidents has tried in vain to make sense of Kim Jong Il's diplomatic feints, while watching as North Korea adds to its stockpile of nuclear weapons. Engaging dictators is rarely a winning proposition. But that doesn't mean it has no place in diplomacy. Doing business with repellent leaders and regimes may offend our moral sensibilities, but it is often the only way to achieve larger strategic aims. FDR needed Stalin's support to finish the war against the Axis powers, even if that meant sacrificing Poland. The Dayton accords left Milosevic in power, but they also ended a bloody war and saved the lives of tens of thousands of Bosnian Muslims. We may loathe the Taliban, but negotiating with them is essential to finding a way out of Afghanistan. And however cynical it appears now, the West's brief dalliance with Gaddafi did produce one lasting benefit: the termination of Libya's nuclear ambitions. The power struggle under way in Tripoli poses real dangers to the stability of the Middle East, but imagine a scenario in which control of an active nuclear-weapons program hung in the balance. In the end, the biggest folly is not engagement itself. Instead, it's the belief that the continued rule of tyrants like Gaddafi represents any kind of long-term stability. For too long, American leaders have declined to condemn the human-rights abuses of those Arab strongmen who happened to be in our favor. That approach has only damaged our prestige and allowed the Mubaraks and Gaddafis of the world to profit at their citizens' expense. A more sensible strategy would be to insist that such regimes open up their political systems and respect the will of their people as a condition of maintaining normal relations with the U.S. If there is any lesson to be learned from the events remaking the Arab world, it is surely that America should stop betting on dictators. There may be occasions when we have no choice but to do business with them. But we should be unafraid to state whose side we're really on. Ratnesar, a TIME contributing editor-at-large, is a Bernard L. Schwartz Fellow at the New America Foundation and the author of Tear Down This Wall: A City, a President, and the Speech That Ended the Cold War. His column on global affairs appears every Monday on TIME.com.